A great tube in every way! 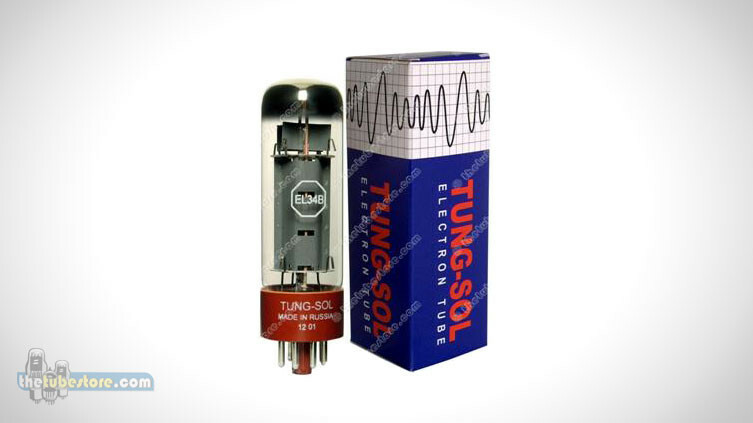 Tungsol EL34B – The Tungsol EL34B is likely to become the #1 choice of currently produced EL34 tubes. The build construction is great all around and the move to welded plates will likely keep “EL34 rattle” to a minimum over time. 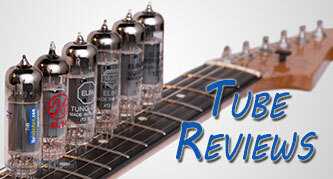 The manufacturer claims that this tube has a hint of 6L6 in its tone thanks to manipulating the plate impedance. This is absolutely true, but the effect is most notable when playing clean and to a lesser extent when the tube is driven hard. At lower volume settings you hear a very pure balanced tone with a bit of the 6L6 sparkle in the higher frequencies while providing a midrange that is a little less prominent than most EL34 tubes. The tubes were very open and airy. The bottom end was percussive in the 2×12 open back combo. When driven into distortion it starts off a bit crunchy like a 6L6 but as you push it, the sound blooms into that singing EL34 tone with great sustain and modest compression. I love these tubes. Over the years I’ve tested many tubes but this is the first time I’ve had to tell myself to stop playing and get on to the next set! Let us know how that goes but I suspect that should do the trick.